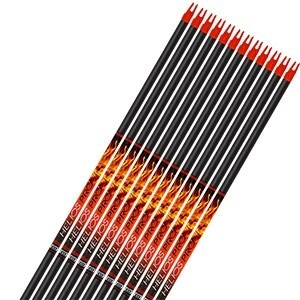 EVERY ARROW IS HAND BUILT FROM RAW SHAFTS` Hand-building arrows allows us do things our big-box competitors cannot. Every raw shaft and its components are checked for flaws in manufacturing before assembly. Every shaft gets properly prepped and every fletch is hand-checked for proper adhesion. Then all nocks are oriented and each arrow is trimmed to your specifications on one of our 8,000 rpm high-speed arrow saws. 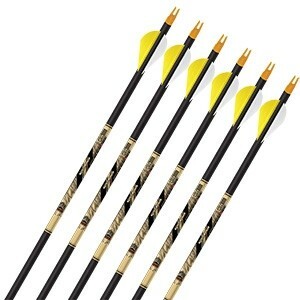 We then install your inserts, practice tips and clean the arrows to remove any oils or glue residues. 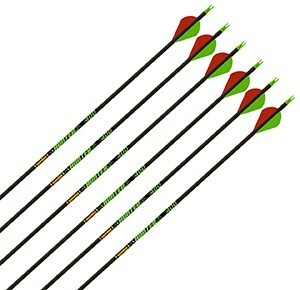 Finished arrow sets must then pass a thorough multi-point inspection before being cleared for shipment to our customers. We realize we're not building ballistic missiles here, but we're quite serious about our arrows. 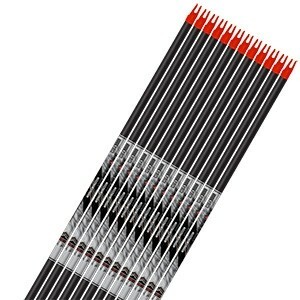 When your custom arrows arrive, we want you to be impressed. Our custom arrows are delivered at your exact specs and they're 100% ready-to-shoot. This is the kind of service you can only get from a real archery pro-shop, and we're proud to set a quality standard a machine simply can't match. 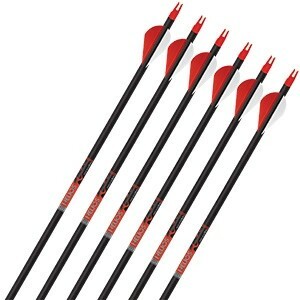 EVERY ARROW IS READY-TO-SHOOT` Don't be fooled by the so-called "field ready arrows" offered at big-box stores. 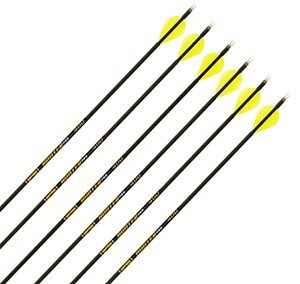 They are NOT finished arrows. 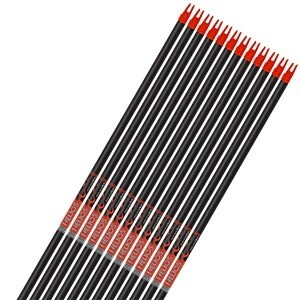 Big-box arrows are simply full length raw shafts which have been machine-fletched with the cheapest available materials (often overseas). They are certainly NOT ready for field use and their quality cannot compare with hand-built customs. 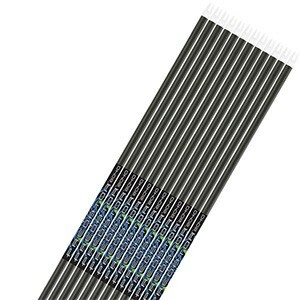 Not to mention, the customer gets very little choice buying machine fletched pre-fabs. Most of the time, you just get whatever is in the box and you live with it. We think that's a pretty low standard. So beyond giving customers more quality and choice, we take it another step by also weighing and documenting every finished arrow set we build. Every completed arrow set comes with our exclusive arrow certification card, which details the exact finished weight and specs of your arrows. Should you ever need replacements, you'll have your original arrow specifications handy. 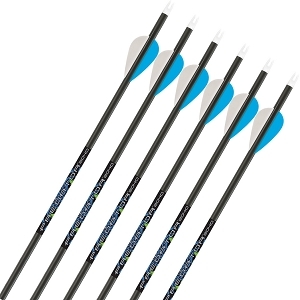 Did we mention we're serious about arrows? If you haven't tried a set of matched custom arrows before, we think you'll be impressed from the very first shot. HOW LONG DOES IT TAKE? WHEN WILL I GET MY ARROWS? The majority (about 94%) of our custom pro-shop orders are processed, built, inspected and shipped in 2-4 working days. In the slower months (Jan-July) we usually beat that average by a day. In the busier months (August-December) we tend to run an extra day. So all things considered, an official 1-5 day lead time is the most honest estimate we can offer. We know our customers are anxious to get their hands on the goods and get started, so we keep our heads down and get our orders out as quickly as we possibly can. If there is any kind of snag or exception, we'll let you know. But generally, it's safe to assume your custom pro-shop order will be on its way in a few working days. Our customer service email system will keep you alerted to your order status along the way. Actual FedEx delivery times will vary by distance from the pro-shop in Oil Springs, KY.